It Is Well: An Ode To Karabo is Johannesburg based Lebo Thoka’s first venture into fine art photography. The 21 year old photographer has undertaken to create the body of work as a means to mediate dialogue and action. 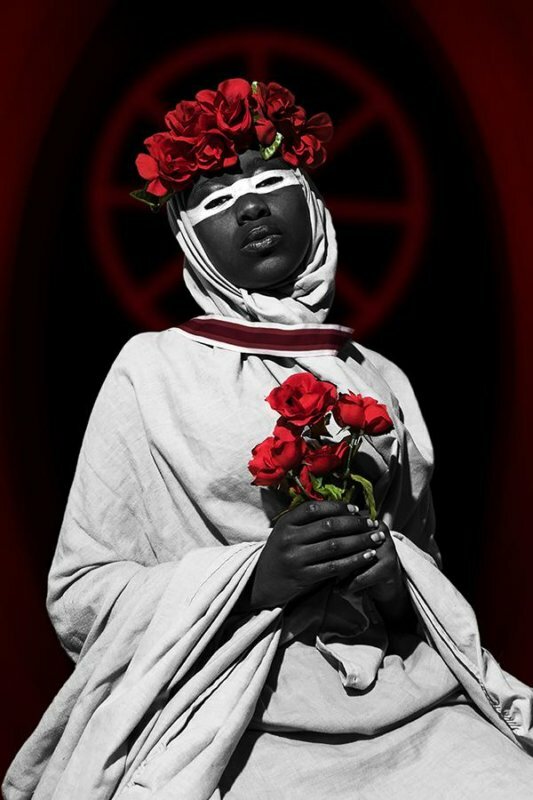 The series hosts self-portraits wherein the artist pays tribute to South African women who have in one way or another been subject to femicidal violence. The works re-iterate the necessity of recognising women as self-existing members of the community. They stress the value of a woman independent of socio-economic, racial and other additives; women cannot be validated by body or institution. The Madonna-esque works engage this notion of value. They decry the moral decay of contemporary South Africa where gender based violence and abuse is concerned. Thoka appeals to the recognition of a woman outside of a relational context, more specifically away from her relation to male counterparts. The dark and often mournful images take light reassurance from biblical Mary to engage that which is oftentimes unacknowledged or unseen of the woman to whom femicide becomes a reality. That which was, is and remains to heal after the trauma. Thoka’s portraits realise an elegant and resilient Mary. She is not without embattlement and trauma; yet beats a confident, if not regal, presence. In the midst of calamity and destruction, she remains bold. Beholden only to an unsung spirit. Be that as it may, she continually engages a toxic environment where men would continually want to beat her to submission and serving a secondary spatial-temporal citizenship. With seeming ease and quiet, her own soul is resolutely divine and imperishable despite her circumstances. The body, however, has become a memorial to modernities in a state of perpetual civil war against her; revering neither body nor being. David Krut Bookstores, Parkwood is proud show this highly necessary body of work as our first bookstore feature for 2018. It Is Well: An Ode To Karabo will open on Wednesday the 28th February 2018 followed by an open discussion on Saturday the 17th March.